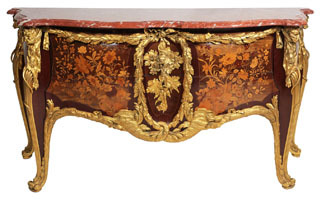 An Exceptional French Louis XV Style Ormolu-Mounted End-Cut Marquetry Two-Drawer Serpentine-Shaped Bombé Commode by François Linke (1855-1946). Circa: 1910-1915. 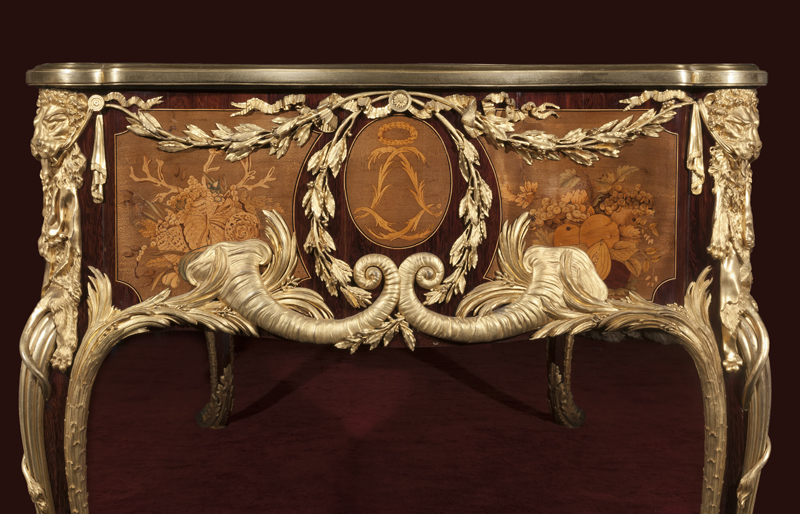 The serpentine-shaped marble top above ribbon-tied laurel festoons, with a pair of drawers inlaid sans traverse with fruit and flowers, centered by an oval medallion with a ribbon-tied laurel-cast wreath framing falling vines above a pair of intertwined cornucopiae, flanked to each corner by a Herculean lion-pelt, the sides similarly-inlaid and with a laurel-cast festoon above and palm fronds below, on four square-tapering legs, each with reeded tapering mount and scrolled acanthus foot, the back left Herculean lion-pelt mount signed F. Linke and with FL cast to the underside of the upper lock escutcheon plate. 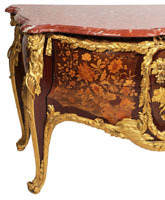 This beautifully serpentined commode in the Louis XV manner and laurel-festooned in celebration of 'abundance through labour' surmounted with lion-pelts, recalling Hercules' labours. A festive marquetry garland is suspended in a laurel-wreathed medallion, while more flowers, inlaid in flanking tablets, issue from ceres' 'horns of abundance' and are supported by beribboned palms emerging from the voluted feet. 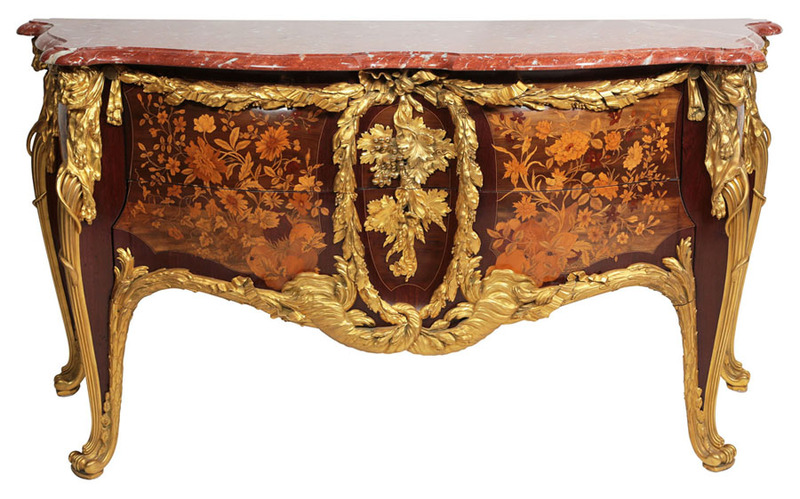 The inspiration for the mounts, derived from models that were executed by the foundery of Jean-Claude Duplessis (d. 1774) for the celebrated bureau commissioned by Louis XV from Jean-Franois Oeben (matre 1759) and completed by Jean-Henri Riesener (d. 1806). By the end of the 19th century, after the grand bureau had been moved to the Palais de Saint-Cloud, copies were manufactured by the leading Parisian Ébénistes including Henry Dasson (d. 1896), whose models appear to have been acquired by F. Linke. 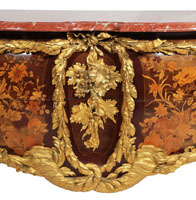 Another example of this commode also by Linke was sold at Christie's in London on 14 May 1998, lot 262. Sotheby's in New York sold another example by Linke on 15 December 1984, lot 33. 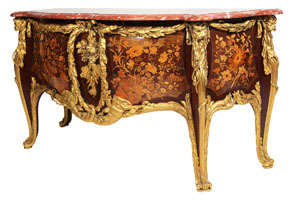 A bureau plat, derived from the secrtaire cylindre by Oeben and Riesener, was sold at Christie's in London, 26 February 1998, lot 202. 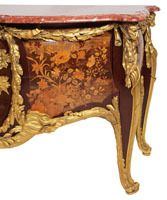 Click here to view a writing table (Bureau Plat) oak carcass, veneered with purpleheart; with sycamore, ebony, boxwood and casuarina wood marquetry, and gilt-bronze mounts by Guillaume Beneman (d.c 1804) with a similar design as this commode and currently at Waddesdon Manor, part of The Rothschild Collection (The National Trust) Bequest of James de Rothschild, 1957; acc. no. 2575. François Linke (d. 1946) was awarded the gold medal for his Grand Bureau at the 1900 Paris Exposition Universelle. He was the most celebrated Ébéniste of his time. Born in Bohemia in 1855, he moved to Paris in 1881. 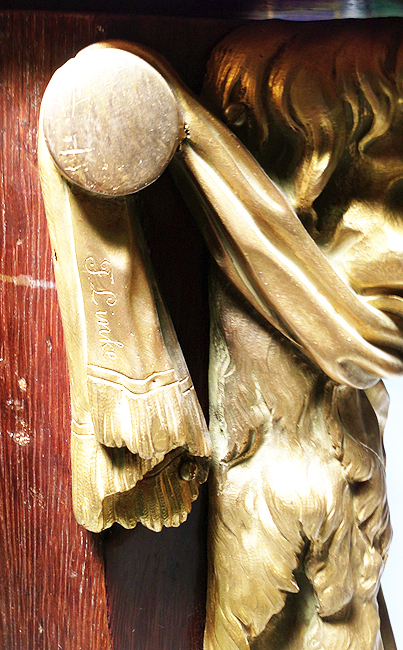 He produced furniture of the highest quality at his workshops at 170, rue du Faubourg-Saint-Antoine, and established showrooms at 26, Place Vendme. 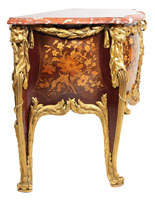 A much simpler version of this commode, with fewer ormolu mounts and with no marquetry, is illustrated in Christopher Payne's "François Linke 1855-1946 The Belle Epoque of French Furniture" Antique Collectors' Club, 2003 Edition, Index 720, Page 498. By 1937 both commodes (as well as many other furnishings from the tapestry drawing room) had moved to Marlborough House where one was photographed in the Green Drawing Room (RCIN 2102061; 2102067; 2102068), and its pair in the Saloon (RCIN 2102043). More recently, the commode which remains in the Royal Collection has been displayed in the Robing Room of the Palace of Westminster.